With this recipe tried and tested and liked by everyone, it feels like a mission is accomplished. Last year when on a sultry evening, after a 3 hours marathon monthly grocery shopping we surrendered ourselves to this ice cream...it felt like we died and reached ice cream heaven. If there is any term to experience anything with all your senses that happened with this ice cream. It was Deliciously creamy,eye soothingly beautiful and breathtakingly aromatic. the cup with a big scoop of this pale coral hued dessert with drippings of nolen gurer syrup has an instant cooling effect but the best part was the aroma, a smoky woody caremelised flavour of the gur, which even in such a horrific summer day brought back the memories of winter. one spoonful and we were sold immediately. after that we had it almost every month on our monthly visit to that specific mall and everytime I promised myself to make it real soon. and today when I made it for the second time and patted my back for almost achieving the same taste am questioning myself why it took me so long. One problem definitely was no ready made recipe. I checked everywhere on net, watched almost all the youtube videos but was not happy with the recipes. egg base will definitely suppress the delicate flavour of this gur and all eggless ice cream recipe vouched for the ice cream machine which I dont have. my search ended when I found this easy method by Mark Bittman. The recipe was simple and I knew I need to make a custard base first with corn starch. 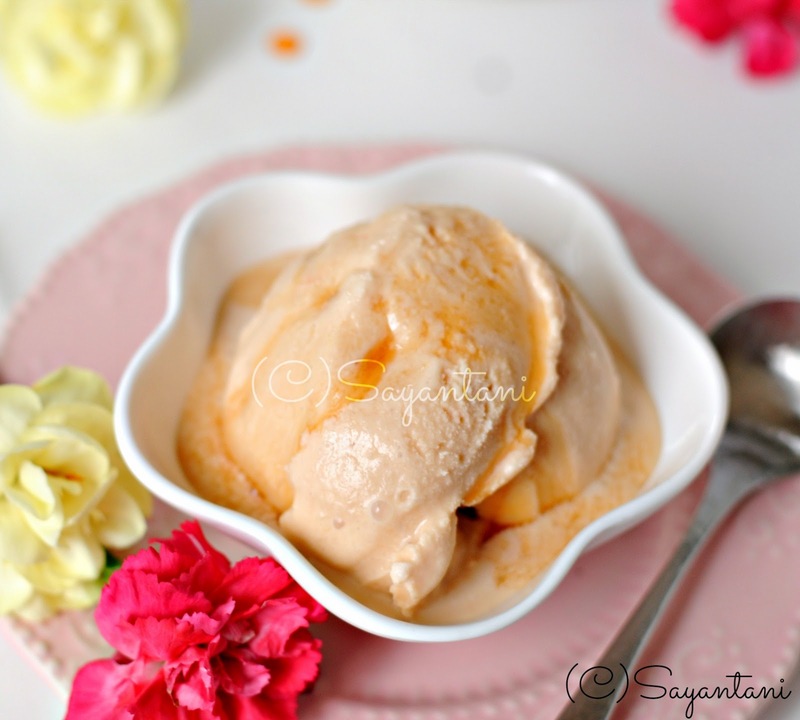 So here is my humble attempt of making a sensational Bengali ice cream without an ice cream machine. I will urge you to at least try it once and if you do decide to make it, please do not try to make it healthy. some things are better unaltered and the cream in this recipe gives a smooth satiny feeling which you will never achieve with low fat milk. If you have an ice cream machine the result would be much smoother. With this recipe under my sleeves I know soon I would be successful to get one for myself too. take the jaggery in a sauce pan add 1 tbsp water and place on low flame. The jaggery will start to melt, stir occasionally to get a smooth syrup. add one more tsp of water if you find the syrup is very thick. keep aside. You can either make all the syrup at one go and store a part of it to drizzle later or can make it separately. Just divide the jaggery the same way mentioned above and prepare the syrup the next day. mix the corn starch with 1/4 cup milk. Use a whisk or a spoon to blend it smoothly. keep aside. Mix the rest of the milk and cream in a heavy bottom pan. place on low flame and stir till it starts to simmer. mix the corn starch mixture once again and pour it in the cream mixture. whisk gently on low flame and the milk will start to thicken. do this for 2 minutes and the custard should reach the required consistency. to check the doneness dip a spoon in the custard. take it out and run your finger on its back, if it makes a clear trail and is not rejoined by the liquid your custard should be done. take off heat and place on a big bowl of ice cold water. gently whisk to cool it. once it 's cold enough to handle (should be warm though) start adding the jaggery syrup. Use a whisk to make a smooth mixture. cool it for 10 more minutes and then pour in a flat metal tray. I used my 8" square cake tin. cover tightly with cling wrap and freeze. after 2 hours take it out and using a fork start beating it. The idea here is to break as much ice Crystal as possible. cover and again freeze for 2 hrs. Do this at-least for 5 more times. Freeze over night and serve next day with some syrup drizzled on top. For best result use full fat milk and dairy cream. Start making it in the morning that way by night you would be able to whisk it 5-7 times. 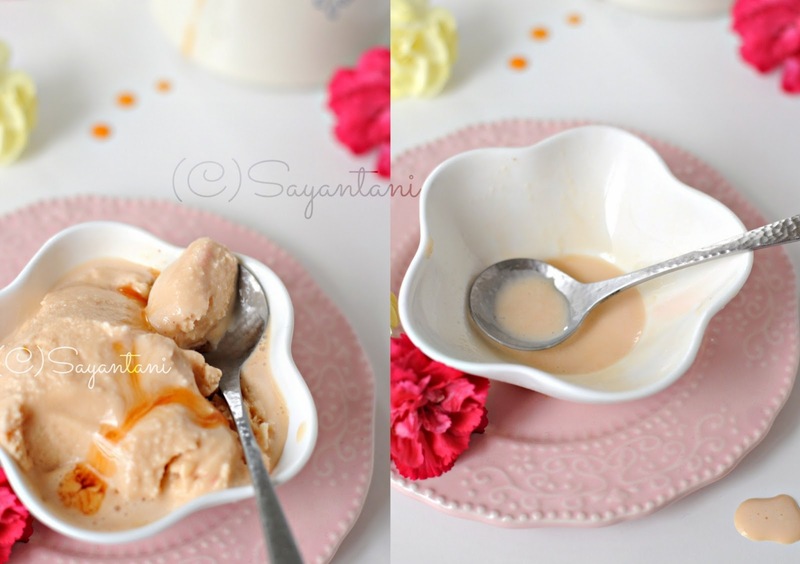 Nolen gurer ice cream recipe, gurer ice cream recipes, Nolen gur recipe, how to make nolen gurer ice cream. 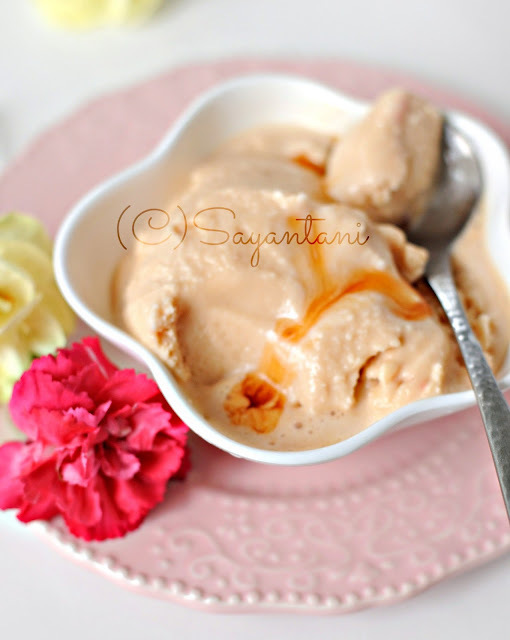 jaggery ice cream. Calcutta special Jaggery ice cream recipe. Wow, just too good, so smooth. After seeing ur click, I can literally feel the taste :):)Sure to make it soon. It looks so yummy ! Like the one we get in market!! Innovative recipe dear...I must try this..
this looks so good... bookmarked!!! I am so running to the market right now to fetch Nolen gur..ice cream without eggs and Ice cream machine! Another stunner creation on my must try list. Nolen gur diye ice cream, sunei jive jol ese galo. Yummilicious and innovative too. Very innovative Sayantani!! Mus ry his as it sounds very simple,but looks divine! Such a beautiful photography and very interesting recipes you have here. I would love to try everything! Nice to meet you and thank you for visiting my blog! Seriously i want some scoops rite now, am hearing for the first time icecream with palm jaggery, will definitely make some soon. 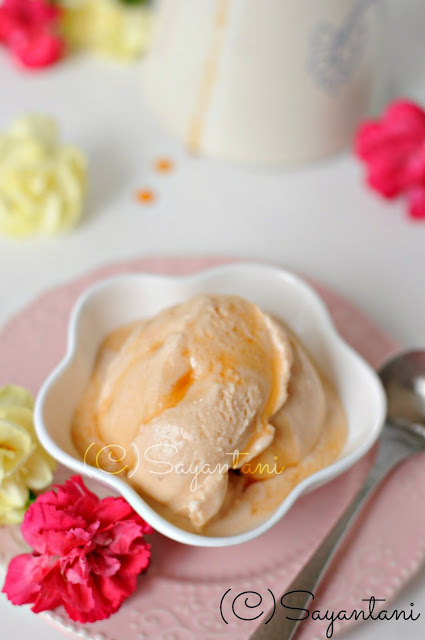 Delicious ice cream without ice cream machine. It looks awesome. Just a quick question.. Is it OK to use whipped cream or I should use heavy cream? I live in USA and those are two varieties I get here. Mekhala. dont use the readymade whipped cream. use cream in liquid form. the fat content should be min. 25%. I love date palm jaggery! This ice cream must be so delicious. Do you think it can be made using regular jaggery? Mustardseeds. you can definitley make with regular jaggery but the usp of this dish is the smoky sweet intense flavour of the date palm jaggery. dont think you will get that. Delicious and interesting ice cream. Bookmarked!! lovely and cool ice creams...the best!!! Thanks Sayantani for this ice cream recipe,was dying to have it once more since its not available to me locally,I can now make it,thanks to you. Would really appreciate if you could drop at my blog space and follow it. 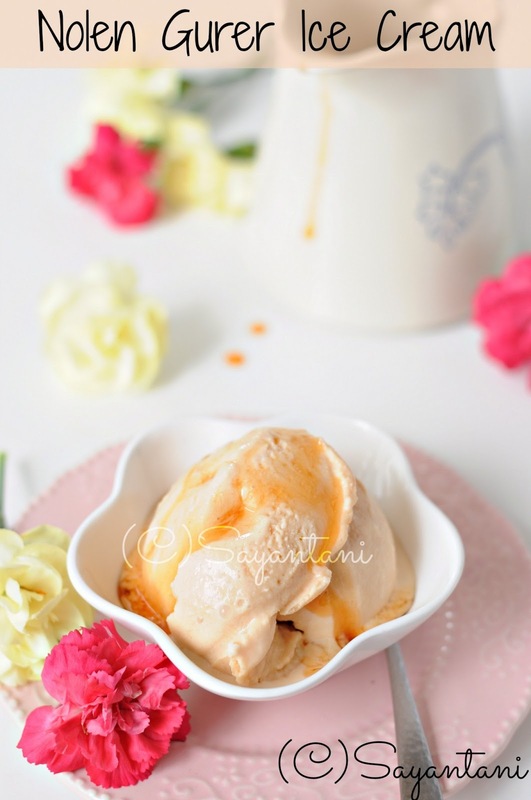 Yesterday I tasted this ice cream at a Bengali restaurant, got hooked, came home googled for it, landed here, am going to try this as soon as I get some date palm jaggery..
Hello, jut wanted to tell you, I loved this post. It was practical. Pretty component of content. I simply sfumbled upon your blog and inn accession capital to say that I gget inn fact loved account your blog posts. Anyway I will be subscribing for your feeds or even I success yoou get right of enry to constantly rapidly. Hi Sayantanidi. Fabulous recipe. Can I use only cream instead of the milk with cornflour. I find milk and cornflour gives ice crystals no matter what you do. Can I use only cream instead of milk n cornflour? Abundance A, yes you can. I was surfing online for desserts to make with nolen gur and I chanced upon your wonderful blog. I am sure I will keep coming back. However, I have a problem. I have followed all the steps here to the T, and yet the ice cream mixture doesn't seem to be freezing at all. Is it because I used the liquid form of the gur? Could that have something to do with the still-runny consistency? Is there a way for me to sort this out? Hoping you can get back before I get greedy and decide to finish off the ice cream mixture as it is.